Get those pencils sharpened and your new shoes laced, because it's time to slip back into a routine. It seems like we've all got back-to-school on the brain—even those of us with seasonal clocks that no longer begin and end with summer break. And even though life may get a little more predictable in the twilight days of summer, it doesn't get any easier—especially for those manning the kitchen. To help you get on your feet, we wrangled four stand-out grilled recipes that marry cost-efficient chicken and the rest of summer's tomato crop. 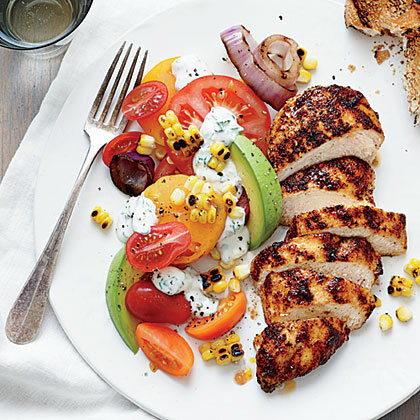 Grilled Chicken with Tomato-Avocado Salad Don't wave goodbye to summer yet—this bright main dish salad has all the season's key players. Mix up a homemade dressing while your chicken hits the grill and you've got a quick weeknight delight for the family. 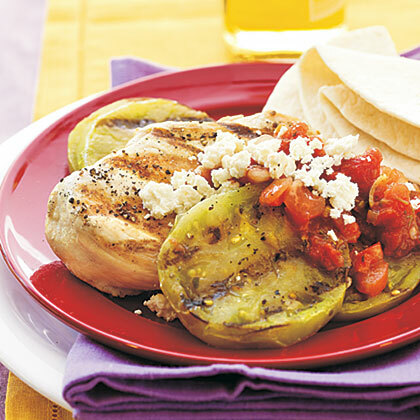 South-of-the-Border Grilled Chicken and Green Tomatoes Give chicken 30 minutes in a super-easy jarred salsa marinade, then you're ready to put everything on the grill. Don't forget to seal the deal with queso fresco just before serving! 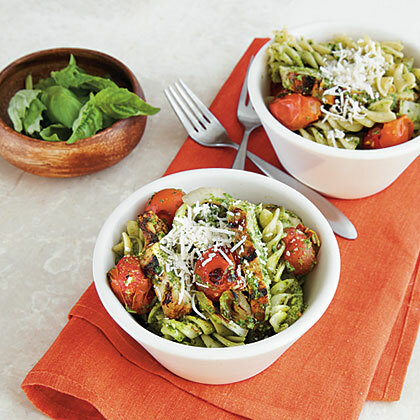 Pesto Pasta with Chicken and Tomatoes Grilling the tomatoes until they "pop" makes the fruit super tender and flavorful. Homemade pesto is a cinch, but if you're pressed for time, store bought pesto will do the trick. 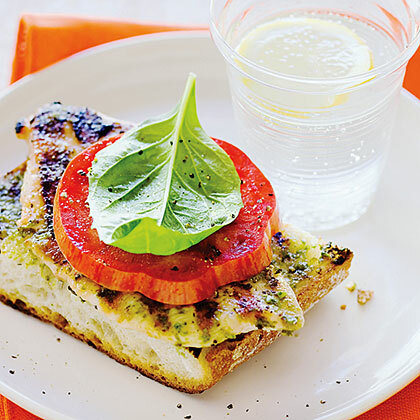 Grilled Basil Chicken Sandwiches Put the timer on for thirty minutes and you have a perfect open-faced chicken sandwich. Fresh basil garnish and a basil mayo make this meal a summer standout.